THIS EVENT HAS SOME OF THE NEW JUMPUP PRODUCERS THATS ON THE TIP OF EVERYONE’S TONGUE ALONGSIDE SOME OF THE FINEST ESTABLISHED MCS IN THE GAME !!!! PST IS 1 OF THE NEWIST VENUES IN DIGBETH AND WILL HOLD 600 FOR THIS NIGHT !!! THERE WILL BE SIGNS TO THE VENUE PUT ALL AROUND THE STREETS ON DIGBETH ON THE NIGHT. 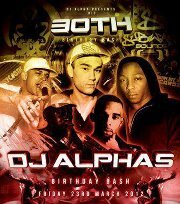 WE ARE PROUD TO HAVE THE ALMIGHTY RAIDERS OF THE OLDSKOOL HOSTING ROOM 2 FOR DARREN DEE’S BIRTHDAY BASH !!!! WE HAVE 29 D…JS AND 22 MCS THAT PROVIDE NOTHING BUT 100% QUALITY JUMP UP & JUNGLE !!!! **EXCLUSIVE** FEMALE DANCERS IN ROOM 1 !!! !